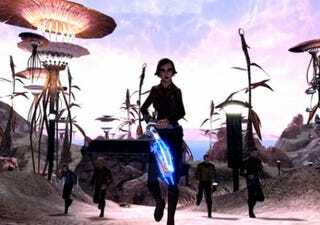 Star Trek Online isn't all phaser shootouts and epic space battles. You'll spend plenty of time exploring strange new worlds, seeking out new life and new civilizations, and boldly so. I've spent a dozen hours in the Star Trek Online beta, and while I've spent more time firing at enemy ships than poking about the surface of strange new worlds, there have been a few moments of simple exploration and diplomacy. There are away team missions where you never have to fire a single shot, which go great lengths towards assuaging my initial fears that this would be Star Trek: Combat And Not Much Else. I've still got a large universe to explore, so let's hope the trend continues.